When you spend all day on your feet, investing in proper protection keeps your feet healthy and your mind focused on the task at hand. If you’ve ever suffered through a workday with painful blisters on your feet, you’re well aware that an ounce of prevention is worth a pound of cure! 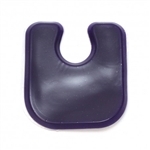 Take care of your feet with silicone stick-on foot pads. Reusable adhesive gel foot pads are easy to wash with warm, soapy water, making for a long-lasting way to prevent blisters that can get infected or turn into tough calluses. Simply apply the sticky gel pad for feet to the areas most prone to friction, take them off at night to wash them, and lay them out flat to dry so they become sticky and ready to use again in the morning. Only Atlas Biomechanics makes these reusable gel foot pads in the United States. We ship your order free when you spend $50 or more!